Emanuel Hall is a deep threat who could help the Eagles' offense. The college football season is in full swing, as we are now into the ninth week of a full slate of games. Austin Bryant, DE, Clemson (6'5, 265): (2) Clemson at Florida State, 12:00 p.m.
Bryant is now the fourth defensive line prospect from Clemson's loaded front that we have covered in this series. In 2017, he had 50 tackles, 8.5 sacks, 15.5 tackles for loss, and 2 forced fumbles. Bryant has good blend of size and athleticism, but you don't see much in the way of polish as a pass rusher. He'll need to develop moves and improve technique at the next level. It's fair to wonder if he benefits from a defensive line that is as loaded as Clemson's, but his frame and raw ability gives you something to work with. David Montgomery, RB, Iowa State (5'11, 216): Texas Tech at Iowa State, 12:00 p.m. The Eagles could use an explosive back who can hit the occasional home run, but Montgomery mirrors some of the guys the Eagles have added in recent years who have not flashed that ability. Still, as we've seen this year, having depth at RB is important, and Montgomery could make sense as a late-round pick. 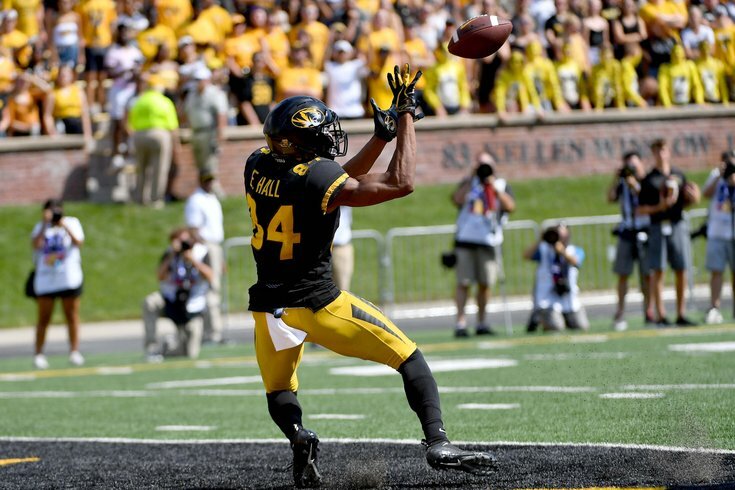 Emanuel Hall, WR, Missouri (6'3, 200): (12) Kentucky at Missouri, 4:00 p.m.
Hall is deep threat with very good size (if accurate) at 6'3, 200 who has averaged more than 20 yards per catch over his career. Hall's speed could open up the intermediate areas of the field, where Alshon Jeffery, Zach Ertz, and Nelson Agholor can do more damage. Elgton Jenkins, C/OG/OT, Mississippi State (6'4, 310): (16) Texas A&M at Mississippi State, 7:00 p.m.
Like Isaac Seumalo, Jenkins is capable of playing every spot along the offensive line, though his best positions in the pros will be at guard and center. In his first three seasons at MSU, Jenkins appeared in 36 career games, with 21 starts. He started 13 games at center, five at left tackle, two at left guard and one at right tackle. In 2018, he is once again the starting center. As they have shown repeatedly, the Eagles highly value offensive line versatility, and they are likely to part ways with versatile backup Stefen Wisniewski this offseason. Jeffery Simmons, DT, Mississippi State (6'4, 300): (16) Texas A&M at Mississippi State, 7:00 p.m. When draft season rolls around, Simmons won't be known for his play on the field. He'll be best known for a video showing him punching a woman repeatedly when he was in high school. Any team will considering drafting Simmons will have thoroughly evaluate his character, though it's worth noting that Simmons seems to be making the most of his second chance. On the field, Simmons is a first round talent at his defensive tackle spot. In 2017, he had 60 tackles (12 for loss), 5 sacks, 2 forced fumbles, 3 blocked kicks/punts, and 2 touchdowns (one on a 90-yard fumble return, one off of a punt he blocked). He is a penetrating force with a repertoire of pass rush moves who would be a good fit next to another former Mississippi State Bulldog in Fletcher Cox. Leading up to the 2017 NFL Draft, the Eagles did a lot of background homework on Joe Mixon, who also appeared in a viral video viciously striking a woman, which shows that the Eagles didn't just immediately remove him from their draft board. The Eagles will surely do their share of homework on Simmons as well.